The versatile retrospective tool for agile teams, collaborate with your team and get better in what you do with a simple, powerful and beautiful tool. Are you tired of spending countless hours on retrospectives? But nothing improves? On average a team spends 4 hours on doing a retrospective. And research shows that 61% of those hours are spent on collecting feedback and manually handling the retrospective process. Do you really understand the hidden costs of manual processes and bad communication? A team of researchers interviewed over 200 participants about giving feedback during retrospectives and found out that most of the time at least 55% people in the groups are not able to speak their mind. -They don't want to blame a specific person. -They don't want to give negative feedback every time. - They are afraid of being perceived as a negative person. Reetro makes it easier to gather feedback by using push notifications. All the feedback is collected anonymously and automatically at the end of each sprint. Feedback items then get assigned to respective columns on the retrospective board. It’s time to rethink how you do retrospectives. 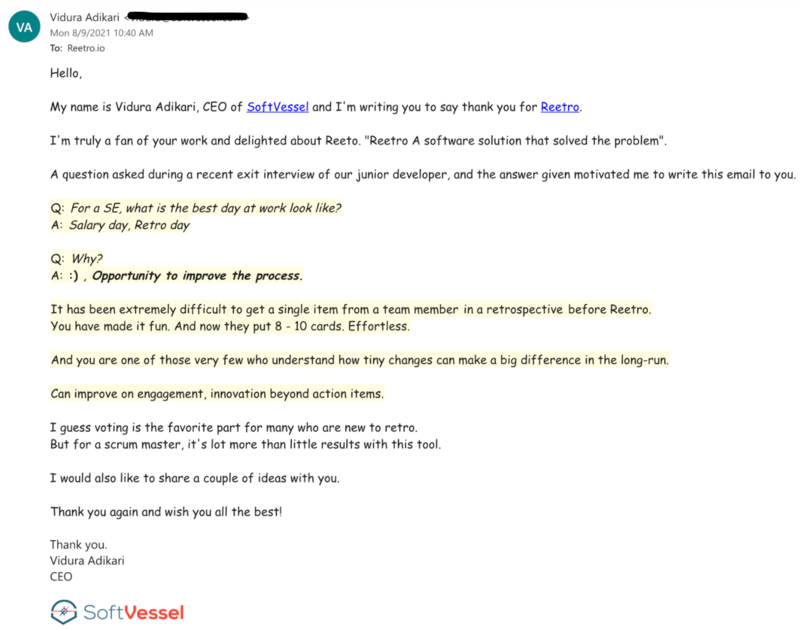 Retro collects the feedback anonymously, So team members can speak their mind. Feedback is automatically mapped to the retrospective board. Reetro offers the possibility to run as a stand-alone tool or as a confluence plugin. Reetro uses machine learning algorithms to learn from retrospective data. Reetro enables you to make informed decisions about the improvement of the retrospective process. What is in Reetro, that is not in the other tools? Reetro is the most powerful, fun and flexible tool in the world. Reetro is created after a deep understanding of the problems an agile team face's when conducting retrospectives. Simple but powerful way to collaborate by using push notifications. AI based retrospective analytics to help you improve over time. We are a team of experienced software developers and SCRUM masters. Our head quarter is in Copenhagen, Denmark. And our development center is in Helsinki, Finland. We are 100% confidant in the capabilities of our system, but what if Reetro isn't good for you? Reetro is guaranteed for a whole month. If for any reason (and you don't have to give a reason) you don't like the product, you can ask for a full refund. We will refund your money with a smile.